Kumbakonam Kadappa is a scrumptious side dish prepared for idlis and dosas. Kadappa is simple yet a flavorful curry made with moong dal, potatoes and coconut paste. It is very popular and common in Thanjavur/Tanjore, Kumbakonam and Thiruvarur. Do try out this delectable Kumbakonam Kadappa and post your feedback. Have a great day and enjoy. 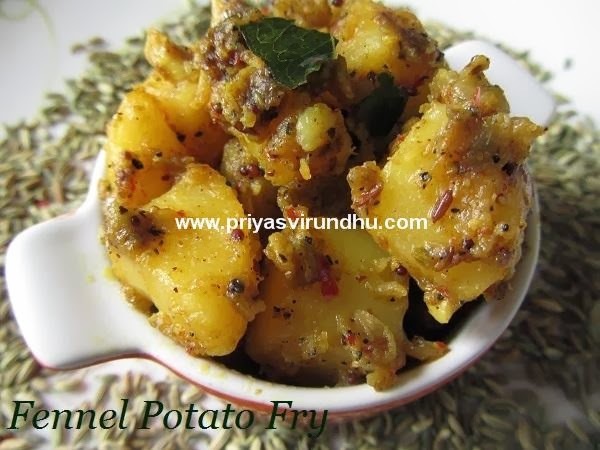 Today in Priyas Virundhu, I am going to share another delectable, easy, flavourful and tasty potato dish – Fennel Potato Fry. Actually I saw a chef making scallops with fennel and pepper powder, so I thought why not try it with potatoes. This fry tasted awesome and I strongly recommend you all to try this easy Fennel Potato Fry. I know most of you must have had Vegetable White Kurma in restaurants served as accompaniment for chapathis/rotis or pulavs/biryanis. 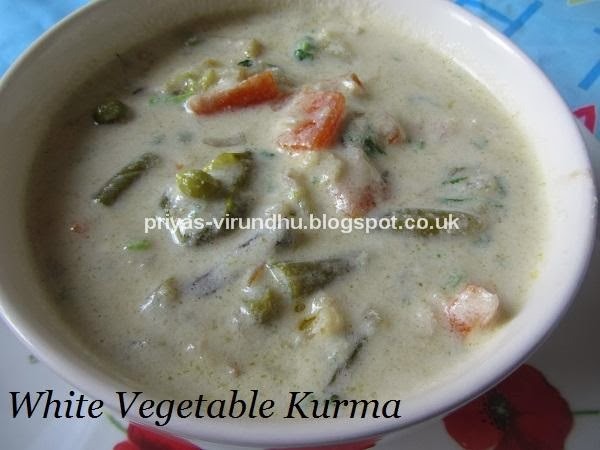 Wondering how to make this delectable White Vegetable Kurma? 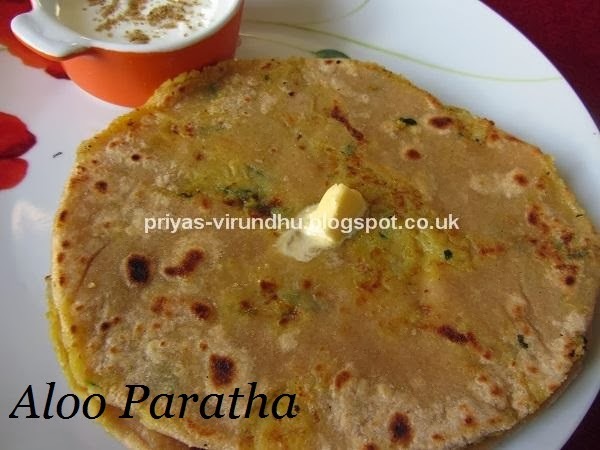 It is made by grinding coconut, poppy seeds, coconut, milk and green chillies. 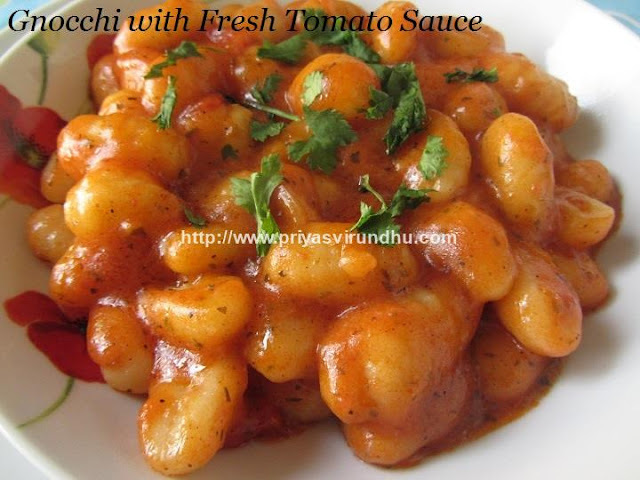 This kurma has a rich and creamy texture and a very healthy dish. Do check out my Mixed Vegetable Kurma here. 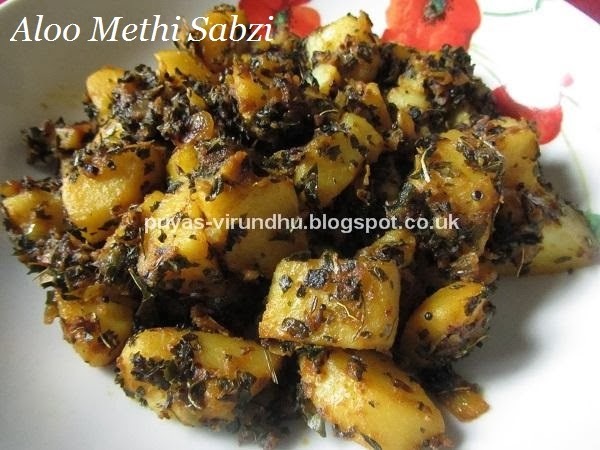 Today I am posting Aloo Methi which I made a few days back. Though I have some of recipes left behind, I hardly find time to do the post. Next week we are planning to go to India after about 1 ½ years, I am all excited. I am kind of busy shopping and packing things. Anyway now moving on to the post, Aloo Methi is a Rajasthani delight. It is a very healthy, flavourful, spicy and yummy side dish which goes perfectly with rotis, rice etc. Vegetable Ishtu is a traditional and authentic dish of Kerala, called as Vegetable stew in English. 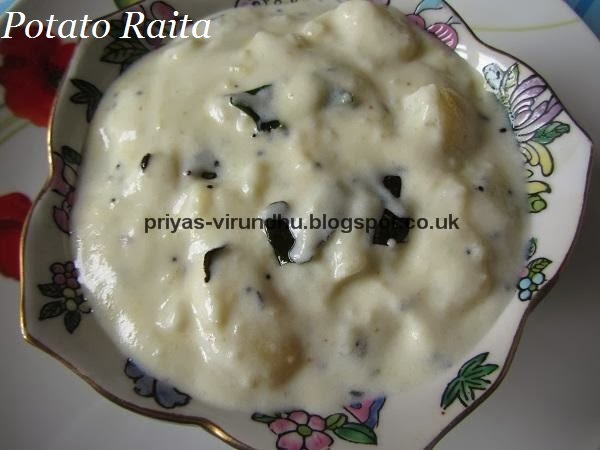 Ishtu/Stew is usually prepared just with potatoes or combination of vegetables. This stew is very easy to make, with mild spices and enriched with coconut milk. 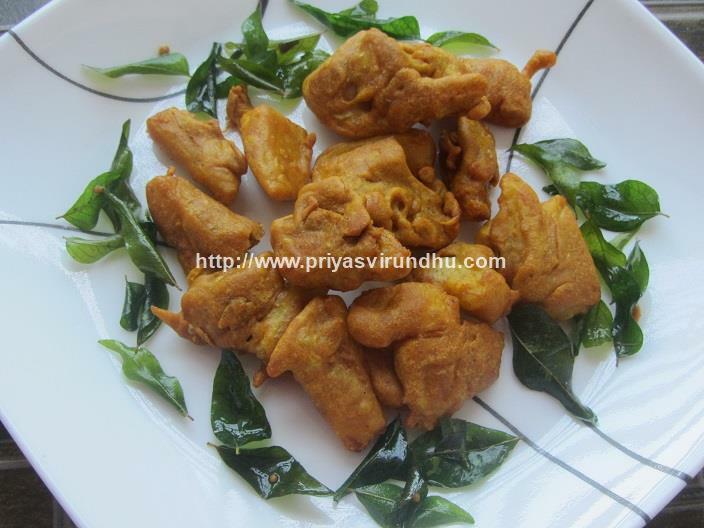 Ishtu is usually served as accompaniment with appam, idiappam, dosa etc for breakfast. 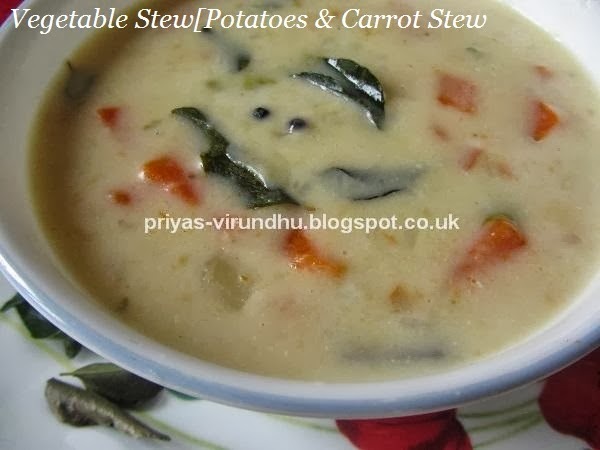 I still remember having this stew at restaurants when I was a small girl, when we used to visit temples in Kerala. I love the creamy and the rich texture of this vegetable stew. Ok, now let’s move on to the recipe. 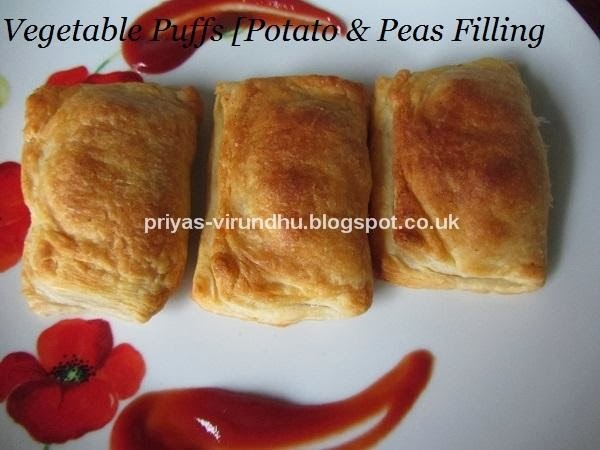 Vegetable puffs is a very popular and a common evening snack in India and is sold in all the bakeries. It is an all-time favorite among all the age groups especially kids. Not only just an evening snack it is a perfect party snack and also is a great hit in all the birthday parties. 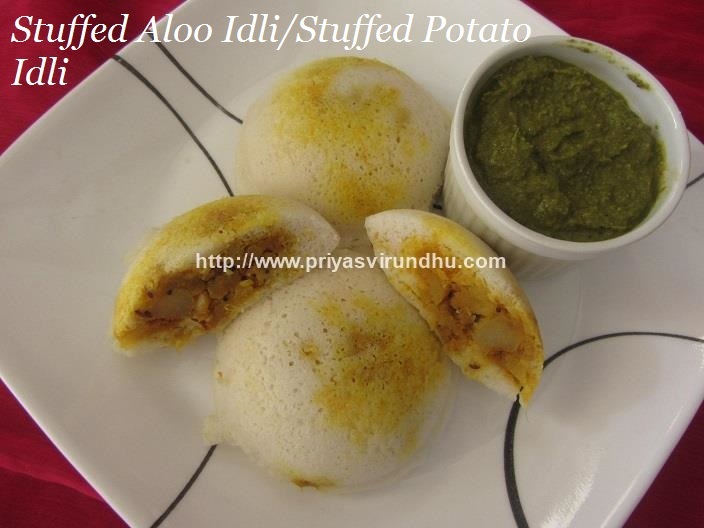 As far as the filling is concerned the potato & peas filling is very common, you can make filling with any other vegetables of your choice as well. There are a variety of puffs available in bakeries like chicken puffs, meat puffs, egg puffs etc. 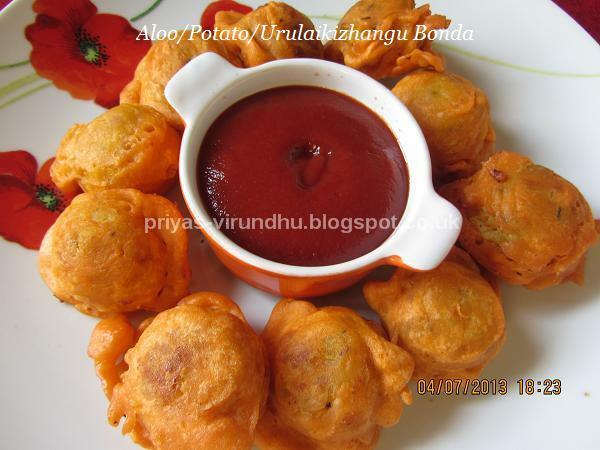 Here is how to make Vegetable Puffs with step by step photos…. 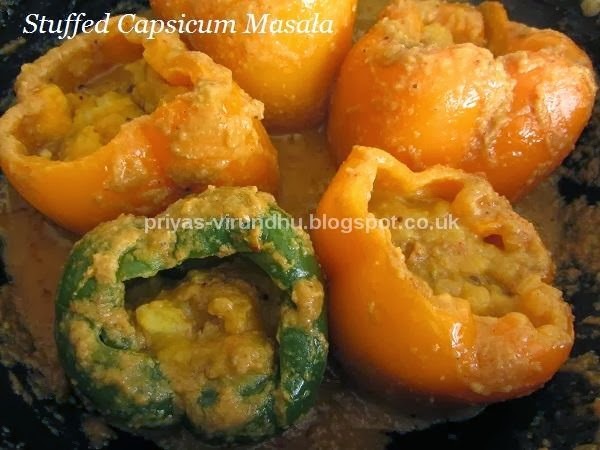 Though this stuffed capsicum masala looks very hard to make, it is really very easy and has immense flavour and taste. I have made potato filling for the stuffing which can be replaced with tomato cheese filling or potato & peas masala filling or anything of your choice. The stuffed capsicum masala is very filling, one stuffed capsicum and two rotis makes one whole meal. I have used different colored capsicums, you can make with any coloured capsicums depending on availability. Now that the weather is getting really cold, I made this scrumptious Potato 65 which I came across years back in one of the magazines when I was in Chennai. 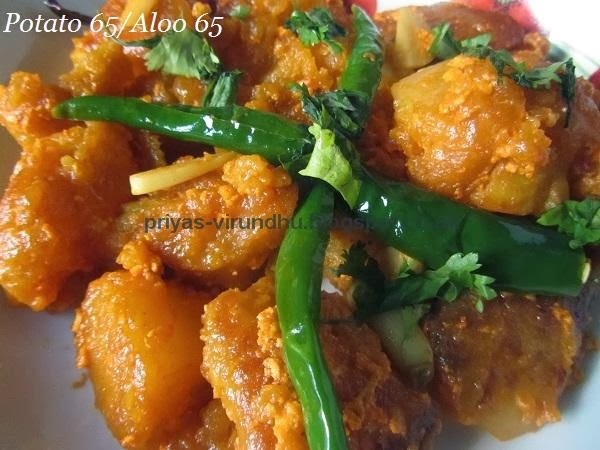 This potato 65 may look spicy with all the red chillies and green chillies, but they are not. This potato 65 is my kids favourite and they can finish one whole plate at one time. Few other 65 recipes I have posted earlier and worth visiting are Chicken 65, Hyderabadi Chicken 65, Prawn 65 , Cauliflower/Gobi 65 and Mushroom 65. Here’s how to make Potato 65 with step by step photos. My dear friend Sapana of Cooking With Sapana is a wonderful person and a versatile blogger. I love the way she cooks. With her step by step cooking she always makes us think all the dishes are very easy to cook. I really admire that she can cook all kinds of food from easy to something that is really tedious and hard. I love lot of her recipes but I would like to mention a few Baklava, kesar peda, chole bhature, eggless carrot and almondcake, tandoori paneer tikka and many more. 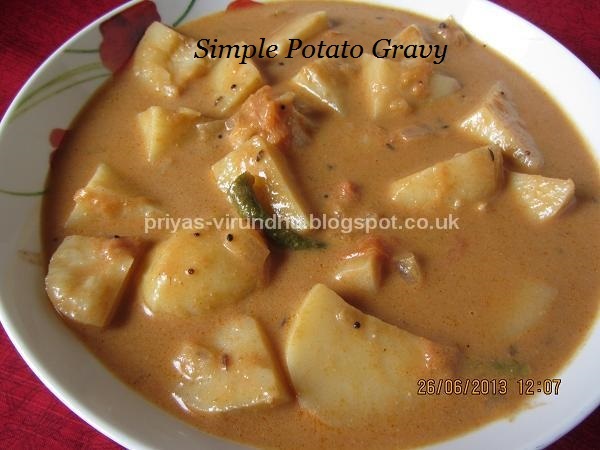 This potato gravy is a very simple and quick to make. I usually make this for my kids, they love it because of the coconut milk. I make another version of potato gravy in which I add tamarind extract, but this one can be made in a jiffy to pack for lunch in the morning rush. Cook anything with potatoes and we (my family) are there right away. 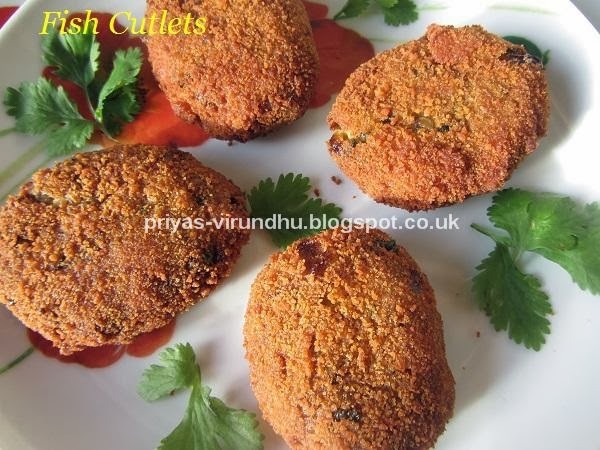 Potato bondas are very addictive evening snack, once you start eating them you will not stop until it is done. The potato is made with wonderful blend of spices, dipped in the batter and then deep fried in oil. 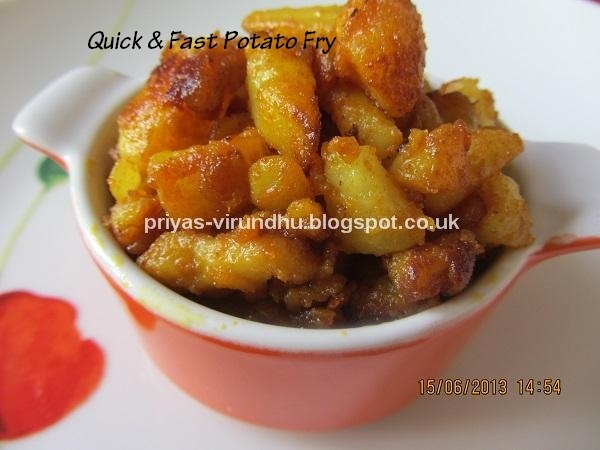 Given ‘potato’ as an ingredient to cook, we can make n number of dishes, this quick potato fry is one among them. 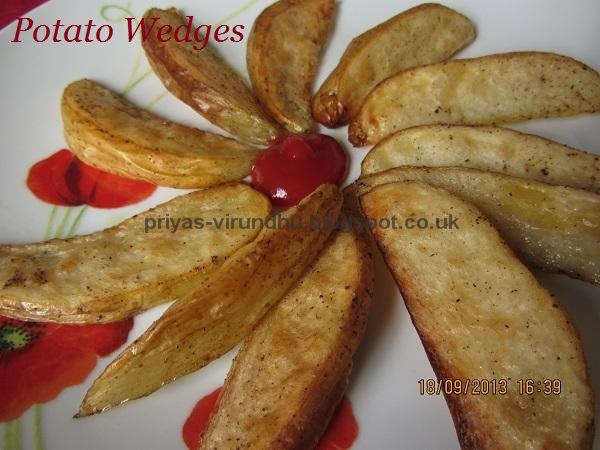 This is my mom’s special potato fry, I make this very often because it can be done in a jiffy and packed for lunch. My girl is crazy about this potato fry, she can finish one whole box of this potato fry.